Tandleman's Beer Blog: Not So Brown and Boring? On Thursday night I was out with an old mate of mine from the USA. We met in the Blackjack Brewery Tap and after a couple of very decent beers my companion fancied a change. "What do you fancy?" I asked? Now he had spent the afternoon enjoyably drinking at Runaway and Cloudwater and wanted something a little plainer and simpler. "Any Holts or Lees nearby?" he asked? We adjourned to the Hare and Hounds on Shudehill for some Joey Holts. This is a splendidly traditional little City Centre local of the type that used to abound, but is now a relative rarity. The Holts was in splendid form and slipped down easily as we sat in the front room, catching up. Time was against us, so we nipped round the corner to the much more recently opened Abel Heywood, which although quite traditional inside is only a few years old as a pub. 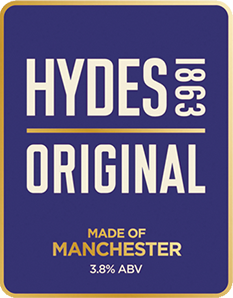 Hydes own this and we settled on Hydes Original which in another era would likely have been plain old Hydes Bitter. My friend declared it even better than the the Holts. He enjoyed very much the balanced malt and hops and the easy drinkability of both beers and he remarked how he really appreciated these kind of beers which are rarely if ever available in his native Pacific North West of the US. By now it was approaching 11 o'clock and the next port of call, the Millstone, for Lees, sadly had to be abandoned. T'internet said it closed at 11 and we didn't want to miss a final pint before I got the last bus. So, more Hydes it was, this time the excellent Lowry, much more modern with Chinook and Citra hops, but unmistakeably British in its malt profile. And that was it, excellent Manchester brewed beers from brewers who have been around from 1849 and 1863 respectively showng that to an American beer writer and beer aficionado, that they can stand proudly against the modern brewers that we are lucky to have so many of in Manchester. We shouldn't overlook them or take them for granted. My companion was Don Scheidt who I have known for many years. Read some of his stuff here. He is by no means the first American beer writer who has made a similar observation about our most traditional of beers. As we walked to the Hare and Hounds, a fellow pedestrian approached. "Hi Don" he said. He was a brewer from Runaway, who a tad ironically knew Don, not me. You can't whack a decent, well kept pint of cask bitter.